AtheistShoes says their shoes are “kitten soft” and super comfortable. They’re only available through the internet. 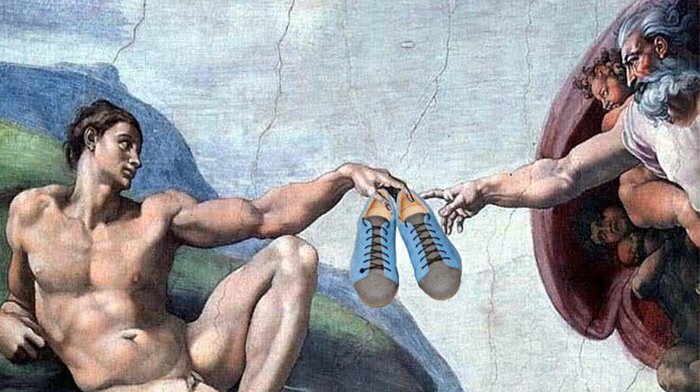 Kickstarter, a crowd-source funding platform for creative projects, helped raise $60,000 for a group of atheist shoe makers to start an atheist shoe company in Berlin, Germany. The company, AtheistBerlin.com, also known as AtheistShoes, hand-makes trendy suede lace-up shoes with soles that say, in large, etched lettering, “Ich bin atheist” (“I’m atheist”) or “Loves Darwin.” Presumably, when a person wearing the atheist shoes walks through a puddle or on a dusty road, for example, the shoes will stamp “I’m atheist” or “Loves Darwin” onto the road with every step. Some of the shoe styles have irreverent names like “Naughty Schnitzel Pilz,” and they come in colors like “Candy Testicle” (a limited edition), or “Kitten Testicle Gray.” But after Atheist Berlin started shipping their shoes, they encountered problems with delayed and lost orders for shoes sent to the U.S. To diagnose the problem, AtheistBerlin conducted a study: They shipped two packages to 89 different people in 49 U.S. states using the United States Postal Service for final delivery. One package had the company’s branded packing tape on it that said “ATHEIST,” and the other was shipped with neutral tape. All packages were shipped at the same time. The results? Packages sealed with “ATHEIST” tape took an average of three days longer to arrive, and were ten times more likely to never make it to their destination. One package with the ATHEIST tape sent to Michigan arrived fully 37 days after the neutrally-marked package. The company conducted the same test in Germany and to several other European countries and found no similar bias. The results, they conclude, demonstrate a significant bias in quality of shipping in the U.S. against atheist-branded packages. The company stopped using atheist-branded packing tape on their shipments to the U.S. and have noted improvement in delivery times. Atheist Shoes also says that since they conducted the study, some people have expressed an interest in buying atheist packing tape. The company is looking into getting enough of it manufactured that they can sell it. I never did understand the meaning of that famous “You take it from me” picture. Which myth is being portrayed? Who is giving what to whom? Now I understand it in a new way. I don’t know whether the new way is better or not than the old way, because I never understood the old way.